The only horse riding tour that combines the dunes and the steppe of Central Mongolia. Our own saddles, studied to suit both the Mongolian horse and the Western rider. ** NAADAM FESTIVAL (11/12 july) : stay 1 or 2 extra day(s) before or after your tour and visit the Naadam Festival, including 1 or 2 night(s) at Dream Hotel + a guide (non private) + grouped transfers (no lunch, no dinner, no entry fees included). *What is a Guaranteed Departure? After taking time off work, booking your flights and arranging for your neighbour to feed the cat, the last thing you need is for your trip to be cancelled because of a lack of people on your tour. Our guaranteed departures give you the peace of mind to book the tour that suits you. Groups of 1, 2 or 3 riders: + 250 € / pers. Applies to the 3 first riders booked. When the 4th rider is booked the supplement is refunded for all riders. Tour and visits as described, horseback rides as described, full board from dinner of day 1 to breakfast of day 13 except 1 dinner, English speaking translator, Russian 4x4 with driver, a cook per group, nomadic equestrian guide, financial guarantee of your deposits. This journey on horseback is a first in Mongolia: you don't have to choose between riding in the dunes or in the steppe! - horse riding in the green plains of the Orkhon Valley. Breakfast and departure with our 4x4 vehicle to the Bayan Gobi Desert, the "rich Gobi." We meet the nomadic herder who will be our equestrian guide for the next three days of horse riding in the wilderness of Bayan Gobi, between dunes and steppes. We set up our first camp in the wilderness, in a sparsely populated area on the southern edge of the Bayan Gobi Desert. Each rider sets up his/her own tent (single tent provided at no additional charge on request before departure). A shower tent and a large tent for the preparation of meals make our camp comfortable. This equestrian tour in the Bayan Gobi Desert is the only opportunity of riding a horse in a typical landscape of the Gobi Desert, as there are no horses deep in the southern Gobi, only camels. This area is truly the heart of Mongolia. It is indeed the Mongolia's geographical center. It is also located at the junction of three major mongolian ecosystems: two of the main mountain ranges in the country - the Khangai and Khentii - and a northern edge of the Gobi Desert. Mount Batkhan overlooks this area and gives rise to several rivers and springs which mix their waters with the sand dunes of Elsentasarkhai - the "sand break" - forming a changing and spectacular scenery. Every night after riding between dunes, rivers and steppes, we set up the camp. On day 4, you will have the opportunity to ride camels at the end of the riding day! The afternoon of day 5 we reach the Khogno Khan cliffs, where we visit Ovgon Khiid monastery, set in a dramatic scenery. After breakfast, a 4-5 hours drive takes us to the Orkhon Valley, a famous World Heritage Site in Central Mongolia. We meet the nomadic herders and horses who will be our companions during the next 8 days horse ride. The change in environment is striking: after the desert and sandy expanses of Bayan Gobi, we are now in a mountainous area, a maze of green valleys with forested slopes. After lunch, we start our first ride on horseback in the larch forests covering the first slopes of the Naiman Nuur Park, in the upstream part of the Orkhon Valley. After the ride, we set up camp in the wilderness for dinner and overnight. These 5 days on horseback are dedicated to explore the famous Orkhon Valley, starting from the upstream part close to Naiman Nuur Park, down to Karakorum, the former capital of the Mongol Empire. During this ride, we will see the Orkhon Falls, visit Tovkhon Monastery, high in the Khangai Mountains bordering the northern part of the Valley, and have a bath at Mogoit Hot Springs! We will end this ride in Karakorum where we will visit Erdene Zuu Monastery on the last day of our ride. For 3 nights, we will set up camp and tents in the wilderness. 1 night will be spent in a guest yurt close to a nomadic family (up to 5 persons per yurt), and the last night will be spent in a touristic yurt camp in Karakorum (2 to 4 persons / yurt - showers in a separate building). The rest of the afternoon is dedicated to shopping in stores downtown, or at the Narantuul "black market" where you will find traditional clothing and objects of daily life. "It took us years to prepare this tour: we wanted to offer a horse riding tour including both steppe and dunes. You will love the diversity of landscapes, and also the fact that both parts of the ride are real itinerary ride, riding adventures from one point to another. You will cover almost 200 km on horseback." 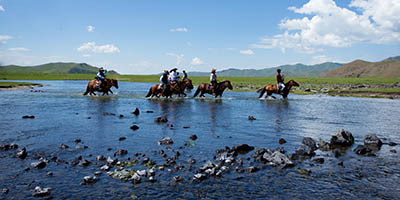 A 2 weeks adventure horse ride in the famous Orkhon Valley, a World Heritage Site. Fast ride for experienced riders. 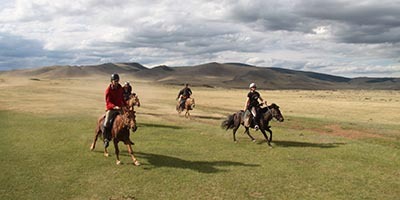 An itinerary horse ride in the Orkhon Valley with the comfort of nights in yurt camps. Fast ride for experienced riders.